Deb Walker has owned & trained her own dogs since high-school age. Deb is a Certified Professional Dog Trainer – Knowledge Assessed (CPDT-KA) through the Certification Council for Professional Dog Trainers, and has earned a Counseling Certificate from the San Francisco SPCA Academy of Dog Trainers (2002). Deb runs K9-Behavior Company of Roseburg, Oregon. K9-Behavior Company offers dog bite prevention classes throughout the Western United States, puppy classes in Roseburg, Oregon and private training for service dogs, truffle dogs, and pet dog owners with new puppies or behavior challenges, using positive reinforcement reward-based training methods. She is a member of the Association of Professional Dog Trainers (APDT). Deb was an Oregon State Sheriffs’ Association Certified K9 Handler of Search & Rescue K9’s for 15 years in ‘Wilderness Air Scent’ ‘Trailing’ ‘Cadaver’ and ‘Water Recovery’. She trained her own dogs, all German Shepherds, and helped others train their SAR K9’s. While retired from SAR, Deb is sought after in K9 SAR circles for her expertise helping handlers solve training & performance problems. Prior to that she trained dogs in the German sport ‘Schutzhund’ which includes tracking, obedience and protection. 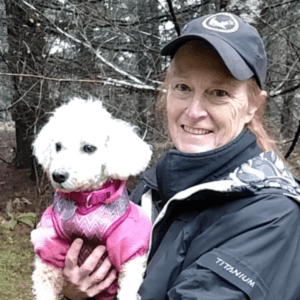 Deb has trained at the Oregon Truffle Festival – Truffle Dog Training Venue since 2012 where 80-95% of the participants’ dogs find truffles in the wild on Day 2 of the Truffle Dog Training! Deb is currently also a Field Representative for PAWS With a Cause, Inc., an organization that provides fully-trained service dogs to people with disabilities at little to no cost. In this role, Deb helps prospective canine recipients determine their need for a service dog and then helps the recipient learn how to use their dog once it is received. Deb Walker is a retired CPA and lives with her husband, Bob and dogs ‘Roger’ & ‘Dotty’, a poodle & poodle mix, both rescues, one a Certified Demo Service Dog, the other a great little truffle hunter. Deb formed K9-Behavior Company in the Portland, Oregon area in 2000 and moved to Douglas County Oregon in 2009.